As a global leader in the design, engineering and manufacturing of prototype, pre-production and mass production equipment for the casting industry, Tooling & Equipment International­ – TEI – delivers the utmost in quality. At TEI our philosophy is founded upon modern technology and methods. We revere our customer’s commitment to global innovation and strive to match it within our own field. Utilizing the latest advances in CAD-CAM software, 3-D sand printing, low pressure casting, CNC machining, and validation technologies, we pride ourselves on our ability to produce complex products all the way from conception through to high volume production. In this unique approach to the industry, TEI produces the first aluminum castings for hundreds of new prototypes and products annually. We also design and build tooling and automation systems to take complex castings into production. TEI products are the highest quality and are backed by a reputation for innovation, design excellence, and precise first-run performance. We are a full service, vertically integrated supplier offering a complete range of services in Engineering, Tooling, Casting, Machining and Inspection complete on one site. This approach delivers TEI and its customers’ fundamental advantages in terms of timing, confidentiality, and quality. TEI is committed to customer service and satisfaction. People are our most important assets. Our employees have extensive experience; many have worked for decades within the company and industry. This wealth of experience is reflected within our products and heritage. TEI can be traced back almost one century to the founding of Automotive Pattern in 1918. As the company expanded, Automotive Pattern outgrew its foundation and in 1983, evolved into Tooling & Equipment International, a dynamic organization with a firm global outreach. By 1998, the demand for its products moved TEI into its current home, an 83,000 sq. ft. state-of-the-art facility, located in Livonia, Michigan. That same year, TEI incorporated the Casting Development Center, capable of rapidly producing low volume, low pressure castings in most aluminum alloys, while also providing a tool testing service, and most recently in house heat treating. In 2001 business diversified into Military and non-automotive castings and machining. 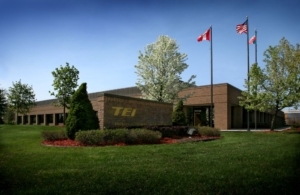 Today TEI employs over 120 people and is a world leader in tooling, prototype castings, and automation systems.